My reflection today concerns the story recounted in John's gospel chapter eight. It is the story about the woman caught in adultery and brought to Jesus to see what he would do. It just seems that these scribes and pharisees spent a lot of time and energy trying to build a case against Jesus. As I have read this story numerous times it occurs to me that these hyper-religious fellows probably used a certain amount of force to wrestle her away from her partner and forcefully put her in the midst of the crowd Jesus was teaching. I've often wondered why they didn't bring her partner too. At any rate, if I was a betting man I would lay you odds that each one of those religious fellows all stood there with stones in their hands ready to bring sentence and execution by stoning according to the law of Moses. As I have become increasingly aware and familiar with the mimetic theory by Rene' Girard it is becoming consistently clear that violence begets violence. Now one might say that this is a trite statement but I'm becoming more and more convinced that we are indeed beings of reflection. This simply means that if we are the recipient of violence there is the strong tendency to reflect that violence back to the perpetrator. As we consider the situation Jesus found himself in with the woman caught in adultery, John reports that he knelt down and began to write something in the dirt. When these religious fellows continued to interrogate him he stands up and faces them and says that famous quote, "Let he that is without sin cast the first stone." Then he kneels back down and continues to write in the dirt. One by one from the oldest to the youngest began to walk away leaving the woman and Jesus alone. The first stone, as I understand it, has no model. In other words until the first stone is cast the others, with stones in their hands, have nothing to mimic. 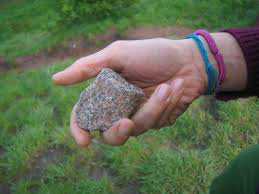 As we have witnessed the violence that seems to be running rampant in our nation these days, gun violence, just like casting stones, seems to become easier after the first trigger is pulled. And at the heart of our violence is the victim who becomes the scapegoat to satisfy our violent appetite until the vicious cycle comes back around again. The word for "sin" in this passage is hamartia which means a distorted pattern- the root of sin is to believe a lie about yourself. Adam and Eve believed the lie that they needed to eat of the tree of the knowledge of good and evil so they could be like God when they were created in His image and likeness to start with. Sin consciousness is what empowers religion. To go and sin no more then means to believe the truth about yourself. And what is that truth? Jesus came to redeem our innocence and he accomplished that in his resurrection. I believe Jesus hit the nail on the head when he said "...he that is without sin cast the first stone." Once we discover our redeemed innocence in Christ Jesus we will be able to put down our violence for good. The only one within this story "without sin" chose not to cast the first stone.